Cardiovascular disease is one of the leading causes of death in the United States and is responsible for approximately 500,000 deaths per year. Early intervention efforts are an important component of patient care, and it is believed that non-invasive techniques for the detection of cardiovascular disease will improve patient outcomes and reduce long-term health care utilization (cost). The relationship between coronary artery calcification and heart disease has been well documented. Computed tomography (CT) has considerable clinical promise in the evaluation of coronary artery calcification, but the relatively high cost of the procedure and the patient exposure to high radiation compromise the use of this approach as a screening tool. The current work takes advantage of advancements in flat-panel technology that enable practical implementation of novel dual-energy subtraction techniques to produce a high-energy image and a low-energy image. 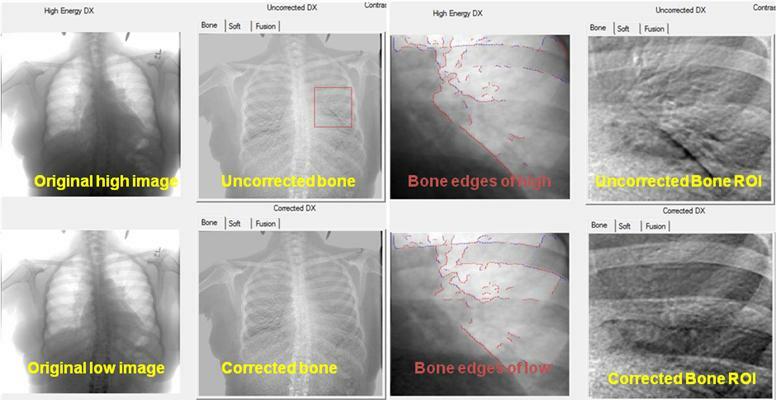 Post-processing of the two images results in a subtracted bone image that optionally displays both bone and the calcified thoracic structure. Clinically, it has been shown that dual-energy digital radiography can improve the detection of coronary artery calcification. Successful commercialization of this technique is the equivalent of a chest X-ray examination being regularly used to screen cardiac diseases in the general population. However, cardiac and/or lung motion causes artifacts on the subtracted images and results in inconsistent detection and diagnosis of cardiac and lung diseases. Although the high-energy and low-energy images are taken within a very short period of time, they still represent different phases of the cardiac and respiration motion cycles. Because the two images may not be perfectly aligned, subtracting one image from the other will generate motion artifacts and reduce the image quality. We are developing a deformable image registration method that can reduce motion artifacts on the subtracted bone images and can thus improve the quantification of coronary artery calcification. 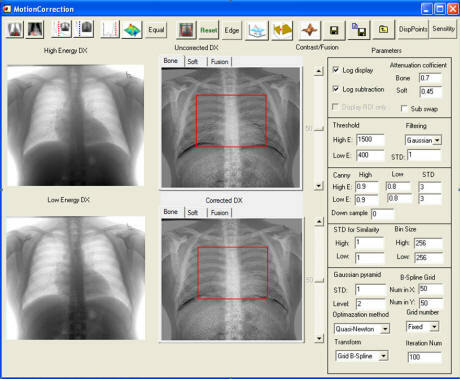 The software program has the following features: (1) Displays the high- and low-energy DX images with the original image and the logarithmic conversion; (2) Computes the bone, soft tissue, and fused images; (3) Contains pre-processing tools to improve the image quality; and (4) Supports two correction methods including deformable image registration. The program can also be used to correct respiratory and cardiac motion and can also be extended to 3D motion correction MRI, PET/CT or other imaging modalities.